I got this disk today and was doing some benchmarks. I thought I should put these here for general information on the drive's performance. It is a Seagate 7200.12 ST3500418AS drive with 16MB cache (compared to 32MB on 500GB 7200.11 model) on nVidia nForce 4 SATA controller. Previously, the ST3500418AS drives were detected as ST3500410AS but this one is detected as ST3500418AS, just like the sticker on the top says. That's a relief! Internet forums are filled with talk about ST3500418AS being detected as ST3500410AS. There has been a lot of talk about firmware issues with the 7200.11 series of Seagate's drives. The issue resulted in the drive suddenly dying without any reason. The 7200.12 series hasn't had any similar firmware issues reported as yet. For all intents and purpose, these drives are impervious to he firmware issues plaguing the 7200.11 series hard disk drives. Anyway, enough talk... 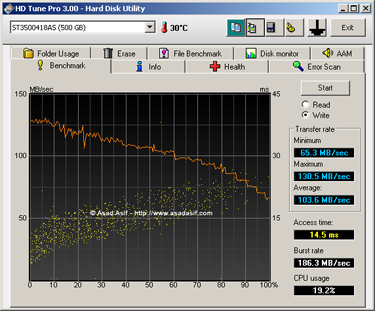 The read and write benchmarks by HD Tune Pro are given below. Click on the thumbnails to see the full image for either benchmark. This disk has an average transfer rate of above 100MB/s for both reading and writing! I reckon two or more of these disks in RAID configuration (mirroring) will work beautifully. If you have got this hard disk, please comment on its performance and idle/load temperatures. Is your hard disk drive detected as ST3500418AS or as ST3500410AS? How do you feel about the reduction in the warranty period? I couldn't care less since there is no stated reason for the hatred. I can't seem to find any relation between your post and the article itself. Thanks for the insight. Its the first time I have heard of this that the HDD isn't identified as what the sticker says but something else. Well personally I don't have this HDD but when I buy it I will let you know. Not to mention I might buy two of these! Asad how come you get 3 yrs warrantly. The local HDDs are sold with 10months warranty. anywhere you know where i can get my next hdd with 3yrs warranty? Plus yeah i had an exact 418AS 500G HDD that died after like 4 months, recently got a new one as warranty replacement for that one. But the new one i got is 32MB cache. Am also using a WD Cavier Green 500GB one . 3 years as in about 10months to an year of full warranty and the remainder a limited warranty. What was the reason for the HDD failure? Mine is working perfectly fine even now. I think the 32MB cache one is the older version from the 7200.11 series. Be careful with it. I have the ST3500418AS, and I have almost 4 years warranty left (it expires in Jan 2014). I get almost the same results. It is quite fast! Do NOT buy this product!! I bought one of these drives in Oct 2009 from Amazon.co.uk. It became totally unresponsive after 6 weeks. Periodic faint clicks could be heard - possibly some switch or poor contact internally. Well, you can't send a drive back for replacement when it has all your private data on it, so I ordered a second identical drive from Amazon. This one failed in exactly the same way after less than 2 days. No firmware solution for this drive according to Seagate website. I had unfortunately already transferred my data to it. So, total loss in the region of £80. I will never buy Seagate again. I bought a pair in september for a raid array, one failed this week, no real warning, it's been alarming in the boot screen for a couple of days, I am trying to send them back to be replaced with another brand, likely the samsung equivalent. Seagate, you were the best, what happened? 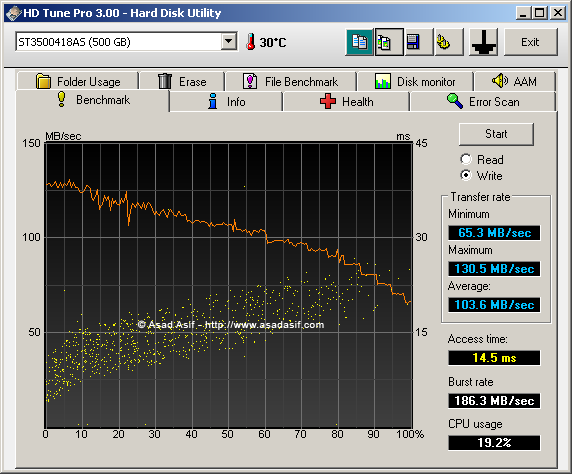 Assuming that your drive is hooked to SATA II controller guessing by Burst Rate, the transfer rate is slow.. Here's my benchmark of same model drive connected to SATA I controller.. Note the Average Access speed and Access time.. I have learn a few just right stuff here. Definitely value bookmarking for revisiting. I surprise how so much effort you place to create any such great informative site. I'm really impressed along with your writing talents as neatly as with the format to your blog. Is this a paid subject matter or did you customize it your self? Either way keep up the excellent quality writing, it is uncommon to peer a nice weblog like this one nowadays..